President Bush will deliver his State of the Union address Tuesday night to a nation that's strongly opposed to his plan for increasing troops in Iraq and deeply unhappy with his performance as president, according to a CBS News poll. Mr. Bush's overall approval rating has fallen to just 28 percent, a new low, while more than twice as many (64 percent) disapprove of the way he's handling his job. Two-thirds of Americans remain opposed to the president's plan for sending more than 20,000 additional U.S. troops to Iraq — roughly the same number as after Mr. Bush announced the plan. And 72 percent believe he should seek congressional approval for the troop increase. However, the poll finds more Americans might back the president's plan if they were convinced it would assure U.S. success in Iraq. SHOULD U.S. SEND 20,000 MORE TROOPS TO IRAQ? …if it increased U.S.' chances for success? However, Americans aren't convinced the U.S. needs a troop increase to achieve its goals in Iraq. Just 26 percent think that's needed, about the same number that think those goals can be reached without sending in more troops. Forty-one percent think the U.S. can't achieve its goals regardless of troop levels. Read the complete CBS News poll results. The president's nationally televised message to Congress may not even reach many of those whose minds he would like to change. Less than half the public says it's very likely to watch the speech — and that answer comes more from those who already support him. There's still more troubling news for the president: By a more than 2-to-1 margin, Americans think Mr. Bush does not share their priorities. Just 28 percent think he does, while 69 percent think he does not. More than two-thirds of Americans also think the country has gotten off on the wrong track, while just 26 percent think it is headed in the right direction. DOES BUSH SHARE YOUR PRIORITIES? 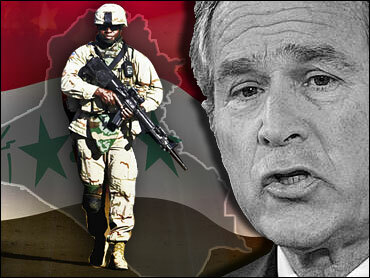 The war in Iraq remains the most important problem facing the country, cited by 33 percent of Americans, far more than mentioned the next top issues, the economy and jobs (8 percent) and health care (7 percent). Only one in four believes the war is going even somewhat well, while three-quarters say it's going badly — something the president himself acknowledged earlier this month and the highest number since the war began. Americans are split on whether Congress, now under Democratic control, should offer a non-binding resolution against the troop increase: 42 percent say yes and 42 percent say no. But more than half of Americans — including most Democrats — want Congress to cut off the money for the troop buildup, including a small number who want to cut funds for the entire war. Mr. Bush is expected to talk mostly about domestic concerns in Tuesday's address — and that is what most Americans want to hear; just one in four wants to hear mostly about foreign policy and Iraq. Thomas Mann, Senior Fellow at the Brookings Institution says, "He's already invested in a national speech on the subject, which was not well received in the country or in the Congress. My guess is he will talk more about the War on Terrorism, and link Iraq to that broader initiative." On the domestic front, Americans think the economy is in good shape, but a majority says the Social Security system needs to be fixed now. The public is split on whether the 2001 tax cuts should be made permanent. More than half think the issue of illegal immigration is very serious, but are divided on whether Congress will actually pass immigration reform. Americans continue to see global warming as a serious problem. Seven in 10 say it is a problem that is having a serious impact right now. A quarter disagrees. This poll was conducted among a random sample of 1,168 adults nationwide, interviewed by telephone January 18-21, 2007. The error due to sampling for results based on the entire sample could be plus or minus three percentage points. The error for subgroups is higher. An oversample of African-Americans was also conducted for this poll, for a total of 221 interviews among this group. The results were then weighted in proportion to the racial composition of the adult population in the U.S. Census. The margin of error for African-Americans is plus or minus seven points.